If you’re in the south east Kanagawa area – perhaps on base or visiting – then Yokosuka Beer is worth popping in for a few beers. It’s probably a trek for all but the hardened readers and drinkers of BeerTengoku. While the tap list is not as extensive as Nawlins across the road, the in-house beers are damned tasty for their price and the atmosphere is just as good. The servings leave a lot to be desired but at least they will top the beers up for you if you ask them – something they should be doing regardless. The prices are reasonable and include tax, and there is no table charge either. Some of the staff do speak English as well but that’s not a surprise – everyone seems to be able to in Yokosuka. Yokosuka has been a bit slow on the craft beer scene considering of the massive US naval influence in the area. It’s even had less success with breweries in the area too – with the closest being Yorocco Beer in Zushi. However, in February 2017, Yokosuka Beer opened up and they have already seen good success with their beers. Two of their beers won medals at 2017’s Beerfes Yokohama so they must be doing something right. Yokosuka Beer is situated between Keikyu Yokosuka Chuo and Shiori stations, with JR Yokosuka being the closest JR station. Yokosuka Beer is in an area known as the Honch – Dobuita Shopping Street. It’s not the most convenient of places to get to but it’s easily found. There are two floors to Yokosuka Beer – the first floor that encompasses the brewery and standing beer area as you walk in and also a camping-themed area out the back. The second floor has a sit-down restaurant with full-on meals. The second floor was packed when we went though, so camp site it was. The whole place is non-smoking and there is no table charge either wherever you sit. There appeared to be eight taps of beer at Yokosuka Beer, though only six were on at the time. Of the six, there was also six different styles on tap – a decent surprise as I was kind of expecting it to be identi-kit IPAs across the board. The beers come in two sizes: glass (330ml) for ¥500 to ¥680 and US pint (473ml) for ¥680 to ¥800. The guest beers are more expensive; however, all prices include tax. The servings are iffy to say the least – too much head but ask them to top it up and the staff will do so. Yokosuka Beer also has a crowler machine with 32oz (950ml) beers at ¥1296 yen – a nice little option if you want to take some away. There isn’t a happy hour nor are there beer flights either. There is a wide variety of food on – stretching from BeerTengoku staples of chips, fried chicken and other small dishes, right up to full three course lunch meals. Be warned though, not all the food is available all over the bar. 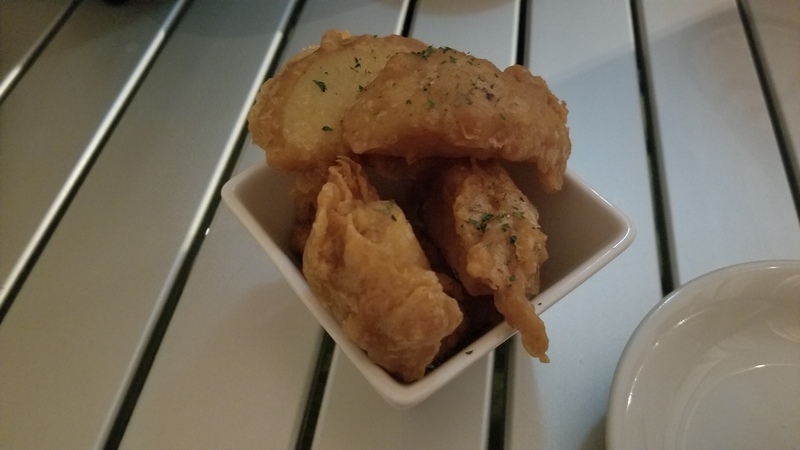 The smaller dishes can be consumed anywhere, but anything bigger than a bowl of rice and some tempura needs to be ordered and eaten up on the second floor. And you know what’s even better, Yokosuka Beer has breakfast going on from early in the day – and yes, you can order beer with your traditional Japanese breakfast. When I arrived at Yokosuka Beer, Rob said “We’re sitting out back”, which I assumed was a beer garden or terrace but was actually a corner next to the walk-in refrigerator done up to look like a campsite. With the lights off. This dismal and cold misery hole was the low point of an otherwise fine craft beer pub. I’m not as tantrum-prone as Rob when it comes to beer head, so for me the beers were fine. Even the weizen, a style which doesn’t usually agree with me. The only complaint I would have is that the corrugated steel everywhere makes it akin to trying to talk inside a shipping container full of chandeliers and bowling balls that’s rolling down the side of a mountain. Not for the softly spoken or hard of hearing, this place. If you’re taking the express Keikyu trains, then Yokosuka Chuo is the closest station; however, Yokosuka Beer can also be reached from the JR Yokosuka line. I have not gone further down the Miura peninsula than Kamiōoka on Keikyū. But, considering what damage I have done at second-hand AV shops at the shopping street leading west from the Keikyū Kamata train station, the mere mention of a shopping street near this Yokosuka station puts it on the short list of areas to investigate the next time I go to Japan. Even if I am not staying in Yokohama. Thank you for the craft beer recommendation of where to relax after I plunder any number of shops on the Shopping Street.